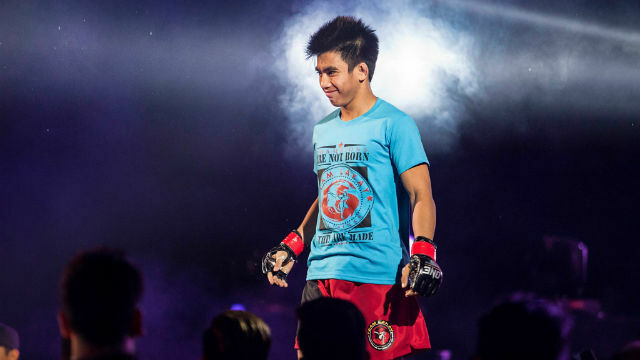 Filipino MMA prospect Joshua Pacio wants to put his name in the Philippine history as the youngest Filipino MMA world champion. Pacio is set to face the current ONE Strawweight world champion Yoshitako Naito of Japan on October 7, 2016 at Thuwuna Indoors Stadium, Yangon, Myanmar, Myanmar. Team Lakay's Pacio with the record of 8 wins wit all by stoppage (3KO, 3Submission) works hard to be the next champion. However his opponent, Yoshitako Naito of Japan is a 32 years old undefeated MMA fighter with the record of 11 wins (1KO, 5Submissions, 5Decisions). The Japanese won his title after submitting (rear-naked choke) Dejdamrong Sor Amnuaysirichoke last May 2016 in his opponent hometown Thailand.